If you are an Italian food lover like my family and me then you are going to love this colorful, juicy, yet simple dish. It’s almost like taking a trip back to the countryside hills of Tuscany, okay, maybe not quite. The freshness of chopped Roma tomatoes, the fragrance of garlic and basil blended with the richness of extra virgin olive oil make this appetizer one of a kind. You can’t buy this at your local grocer and it is so easy to make, why would you want to? To add a spin or some gourmet flare to your holiday party this year add this appetizer to your menu, it won’t disappoint. Prep: This recipe is best when made a day in advance, just enough time to allow the juices to become really flavorful and the tomatoes to soak up the goodness. 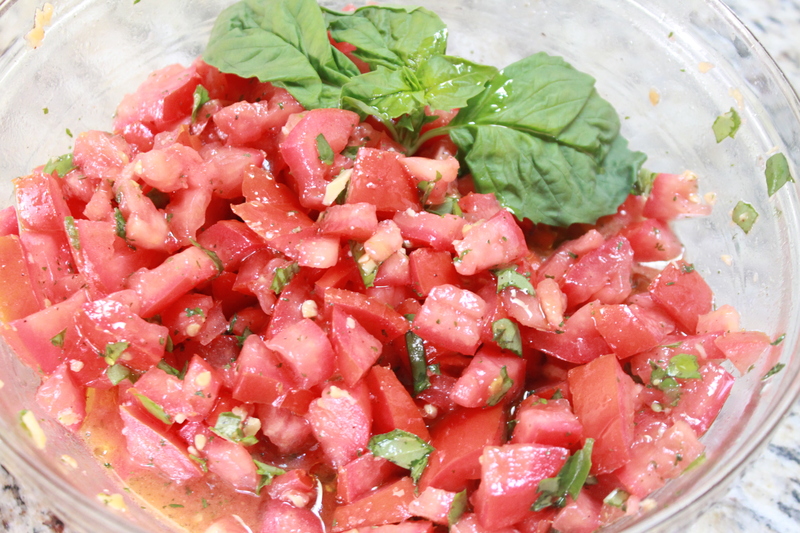 You will need a medium-large bowl to mix Bruschetta in, set aside. Begin by dicing tomatoes to one-fourth inch squares or thereabout, set in mixing bowl. Mince two cloves of garlic and finely chop basil, add to bowl. Drizzle with olive oil and sprinkle desired amount of salt, stir and cover with plastic wrap and set in refrigerator. notes: I love to serve this Bruschetta with toasted baguette bread and a platter of antipasto, usually olives, roasted red peppers and peperoncini. You can also add mozzarella balls and pancetta or salami to your tray for hardiness. May I suggest if you do a lot of tomato chopping in your kitchen to buy yourself a good knife for the job! I can see why some of the ladies in my cooking group, The Stocked Freezer, despise prepping tomatoes … they don’t have the right tool to do it! I am a personal fan of the Wusthof collection of knives, I have included a link below. … just a reminder that The Stocked Freezer meets tonight for our session ‘BreakFAST’ quick, easy and healthy breakfast foods for a family on the go! Yummy! I adore simple Italian bruschetta. Excited about your blog. Would love to see some of your recipes/ideas for BreakFAST. Hope you are well.